We are participating in an unusual process, blogging. It changes us even as we change it. I have been blogging for more than a year and a half and I have enjoyed every minute of it. From the very beginning, I knew I was riding a wave of great power and almost infinite reach. It was made more interesting because I found myself among friends who rode their own waves. The wave analogy may not be an exact one because blogs experience surges of traffic which are partially under our control. There is a similarity however, in that blog visitors, like ocean waves, are driven to us by by distant bodies of great magnitude. There is an incredible thrill when we discover new friends amongst the millions of people who inhabit the blogosphere. We often become fast friends because of certain ideas we share, even though many other viewpoints (political, personal, and business) may be worlds apart. I visualize our interests and activities being more like 26-pointed Moravian stars rather than solid spheres. We intersect the lives of others and reach a deep understanding in one or two areas without reaching agreement on any others. The illustration is my visualization of bloggers at play. To see a real-life representation of this go to Touchgraph Google Browser. Our interaction is all the more meaningful because it is freely given and taken. We receive helpful suggestions and advice from our online friends without interruption from spouses, bosses, children, or pets. We can share our joys and achievements and leave each other to work out the details offline. We are not burdened by the day-to-day tedium/misery of each other’s lives, unless we care to share it. I see countless people, including myself, working out their destinies and sharing the experience online. When the sharing is done to enlighten or to ease the way for others to follow, this makes fascinating reading. I see a tapestry of events being simultaneously documented in searcheable format. If I want to shoe a horse, build an ultralight plane, or publish a novel, I am no longer limited to finding a library with the right book. I can find someone who is doing it today and use their experience as well. What is even more interesting is that I find my purpose in blogging is being steadily influenced by the new bloggers I encounter. I hope to expand on that in the next post. Meanwhile, you might amuse yourselves by considering the ways in which your lives have been changed by blogging. You may be surprised at what has occurred. 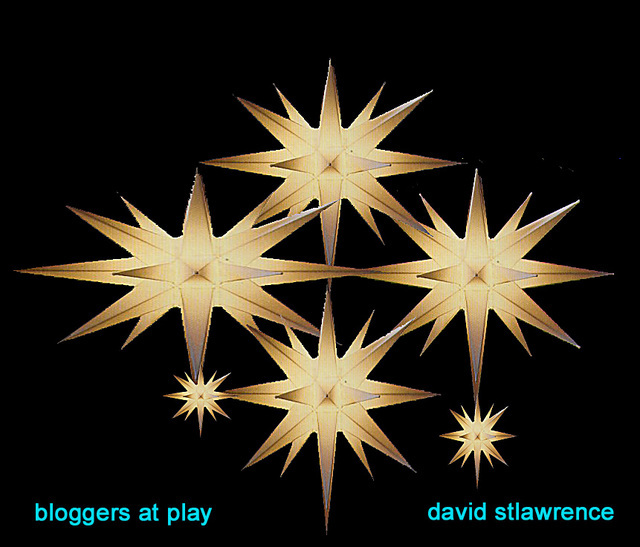 David, I have been blogging for month now and I agree with your thoughts on blogging, especially your mission statement (Why I write). 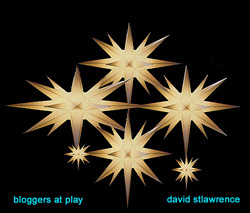 Your Moravian star analogy is beautiful and apt.